Two isomeric conformationally restricted analogues of 4-trifluoromethylpiperidine were designed. The synthesis was performed in four steps from commercially available N-benzylmaleimide. The key reaction was the [3+2] cycloaddition between trifluoromethyldiazomethane and N-benzylmaleimide. 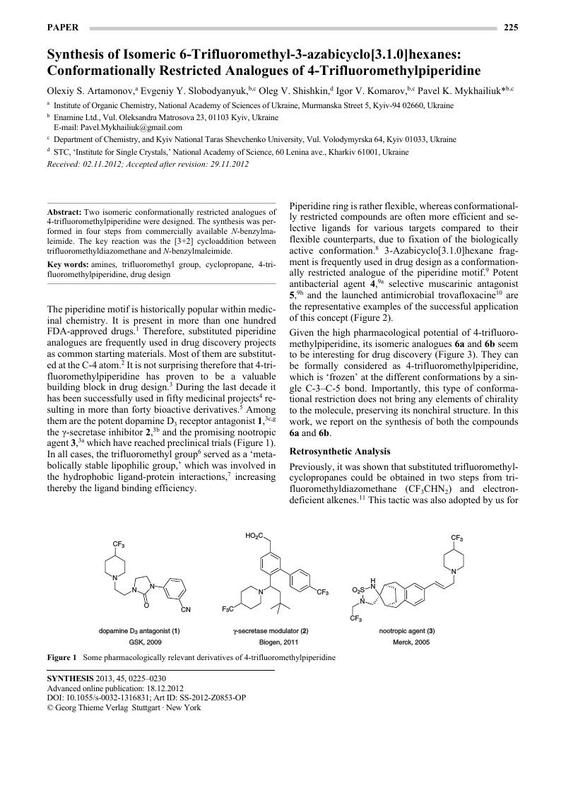 for this article is available online at http://www.thieme-connect.com/ejournals/toc/synthesis. Included are copies of NMR spectra and crystallographic data for compounds 12a and 14. 4 The search was performed in July 2012 in ‘Reaxys’ database. 5 The search was performed in February 2011 in ‘MDL Drug data report’ database.